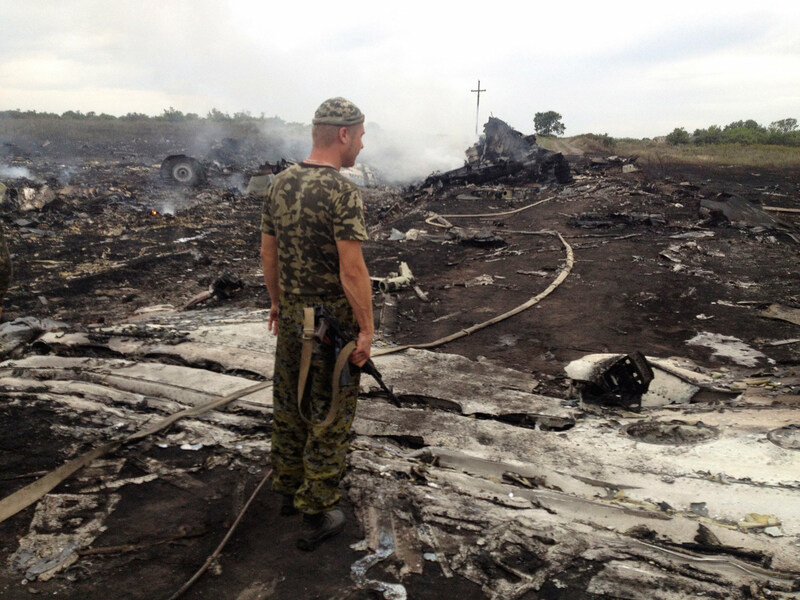 Ukrainian officials and pro-Russian insurgents trade accusations as details of crash remain unclear. Soon after the horrific news began circulating that a Malaysian Airlines Boeing 777 had crashed in eastern Ukraine, both the Kiev forces and pro-Russian rebels fighting there agreed that the plane had been shot down. But explanations of who shot it down—and why—immediately began diverging wildly in what has become the latest battle in the information war that has been waged between Ukraine and Russia since protests began in Kiev in November. The 295 people killed in the crash could not temper the politicized finger-pointing. For his part, Vladimir Putin refrained from saying who might have shot down the plane in a segment broadcast on Russian television, but noted that Ukraine “bears responsibility” for the downing of an airliner on its territory. The rebels immediately began denying their involvement and blaming the Ukrainian military. On Twitter and in interviews, Alexander Borodai, the Muscovite who heads the self-declared Donetsk People’s Republic, maintained that the rebels did not have weapons capable of hitting an airplane at the height Malaysia Airlines Flight 17 was traveling, above 32,000 feet. “It was shot down by the Ukrainian military. I think this is a deliberate provocation,” Borodai said, using the term that both sides have employed to explain many murky incidents over the four months of fighting in eastern Ukraine. Pundits in the Western media quickly joined Gerashchenko in claiming that Moscow had provided the pro-Russian militia with the advanced missile launchers. The Ukrainian representative to the United Nations went further, promising to “present the evidence of Russian military involvement into the Boeing crash.” But Putin’s spokesman Dmitry Peskov said allegations of Russian involvement “stupidity,” and the rebels had said in June that they captured the Buk missiles from a Ukrainian air-defense base near the village of Oleksiivka. The Ukrainian intelligence service released an intercepted recording it said showed Russian rebels admitting to downing the plane, but dismayed that it had turned out to be a civilian flight. Similarly, a deleted post on a social network page that has published statements by the rebels’ military leader, Muscovite Igor Strelkov, praised the downing of the plane, also under the assumption it was a military flight. Meanwhile, increasingly wild versions of events began to appear. Representatives of the neighboring Lugansk People’s Republic told Russian state news agency RIA Novosti that unnamed witnesses had seen a Ukrainian fighter jet attack the Boeing 777. Russian defence analyst Igor Korotchenko, editor of the National Defence journal, said on Rossiya 24 and RIA Novosti it was “obvious” that MH17 had been accidentally shot down by poorly trained Ukrainian government forces while checking the battle readiness of a Buk missile launcher. But Western military experts on CBS News and elsewhere argued that taking down the plane with a Buk would require extensive training and a careful shot. RT and other Russian media began quoting a confidential source at Russian Aviation arguing that Ukrainian forces had been trying to down Russia’s presidential plane, which he or she said had passed through a certain airspace near Warsaw shortly after the Malaysian airliner had. Among Twitter accounts supporting the rebellion in Ukraine, it was common knowledge Ukrainian forces had shot down the airliner, only their goal had been to draw Western forces into the conflict in eastern Ukraine. Rossiya 24 hinted at a similar conclusion when in between segments on the downed Boeing 777 it broadcast a recap of Siberia Airlines Flight 1812, which the Ukrainian military admitted to accidentally shooting down over the Black Sea in 2001. Pavel Felgenhauer, a Moscow-based defense analyst and columnist for the independent Novaya Gazeta, said the fact that the rebels had shot down a Ukrainian military An-26 transport aircraft on Monday at about 20,000 feet—one of three military aircraft they downed this week—proved that they had acquired more powerful weaponry.